The Web's most complete collection of John Muir's thoughts about God and the spiritual aspects of nature. This is creation. All that is going on today, only men are blind to see it...They can not pause long enough to go out into the wilderness where God has provided every sparrow enough to eat and to spare, and contemplate for even an hour the wonderful world that they live in. You say that what I write may bring this beauty to the hearts of those that do not get out to see it...The good Lord put those things here as a free gift that he who chooses may take with joy - and he who will not walk out of the smoke of the cities to see them has no right to them." 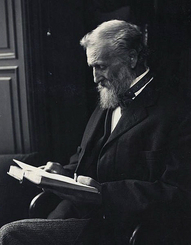 John Muir Quotes features John Muir's spiritual views in his own words. Muir's thoughts and words about God and Nature are presented here in as complete a form as possible. Please take a moment to consider supporting our sponsor.